Lent is a good time to learn about the Beatitudes. 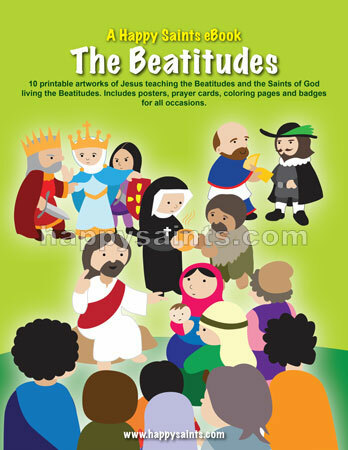 The Happy Saints Beatitudes eBook is a special edition PDF ebook featuring 10 printable artworks of Jesus teaching the Beatitudes and the Saints of God living the Beatitudes. Includes printable posters, prayer cards, coloring pages and badges for All Saints Days and other occasions. A great resource for Lent, you will find the Beatitudes coming alive in the examples and actions of the saints! View samples and download the ebook here!